The scene without a Boomslang – English Phonetic – a drowsy, summer afternoon, heat soaked bush, thick and still, the quiet interrupted now and then by the buzz of some manic insect carrying on with busy work. The plated lizards have left their rocks and retreated to ground level into the damp warm shade. Larger creatures hang around in sleepy groups in the heavy gloom of thicker bush. Birds, up before dawn, twittering and tweeping, frantically filling little beaks and answering the relentless cheep, cheeps of tiny tyrants, have seemingly vanished. Fully absorbed with canvas and computer, a continual chirruping and squawking began edging into the zone of concentration. And the sound grew in volume and urgency, the birds were screaming! 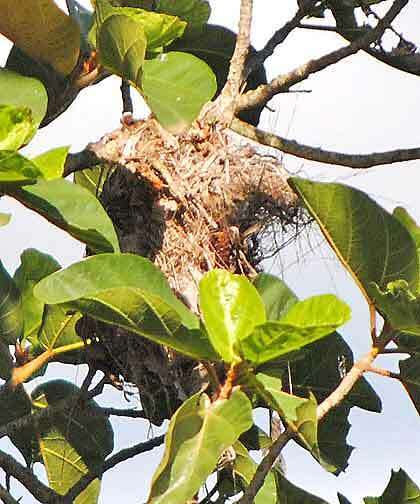 Rushing out onto the Treehouse balcony, the tree beside the Nyum Nyum tree was full of agitated birds of all shapes and sizes. Frantically fluttering and chirruping, every local feathered resident had turned out for this dire emergency. OK, so where’s the fire? It didn’t take long for M to trace the perpetrator. The sinuous, scaly boomslang snake spends most of its life in the trees and can be anywhere from one to two metres long – 3-6 feet. Don’t let the big eyes fool you. 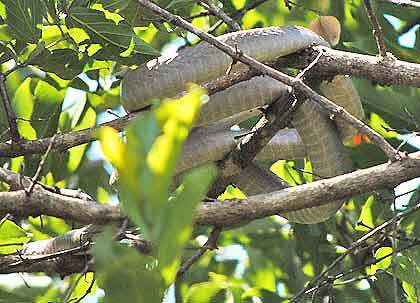 This is a dangerous snake to have around and every bird knew it. This is a very poisonous back-fanged snake with the ability to unhinge its jaw and bite you anywhere it likes. 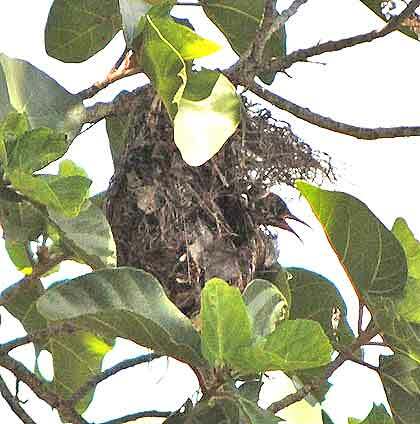 While the trees are full of parents and fledglings and almost-hatched-eggs and other stages of birdie family life, killers lie in wait. This is the bush, it’s wild, raw and real predators are everywhere. 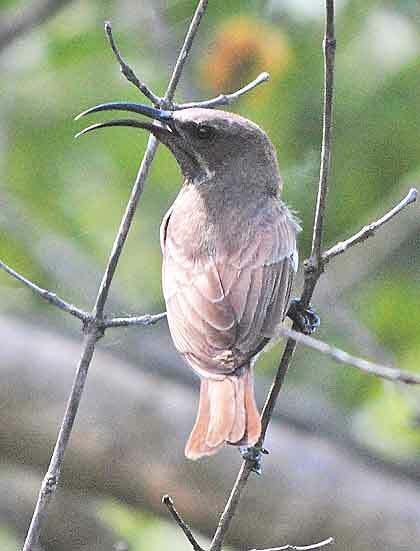 With an amiable display of solidarity, go-away-birds, bulbuls and passing strangers turned out to assist the scarlet chested sunbirds with their crisis. 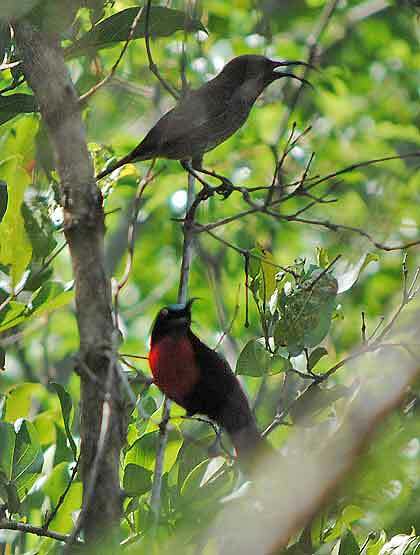 The go-away-birds bravely pushed the boomslangs’ advances back, all the while risking the chance of a strike. 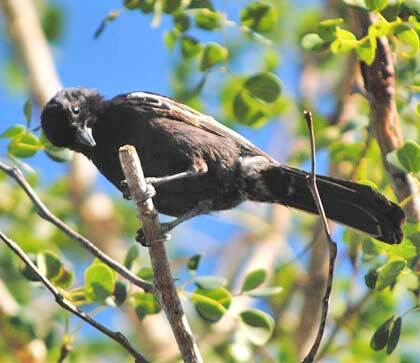 The other birds with their noise and movement added a potent confusion of chaos. It wasn’t quick. 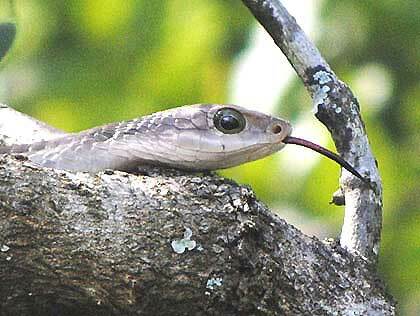 The boomslang kept advancing toward the frantic birds. The go-away-birds would constantly reposition and in retaliation the boomslang struck out once or twice but never managed to make contact. And eventually, he/she tired of being dive-bombed and chirped at, turned and headed back along the trees, away from the brave defenders. 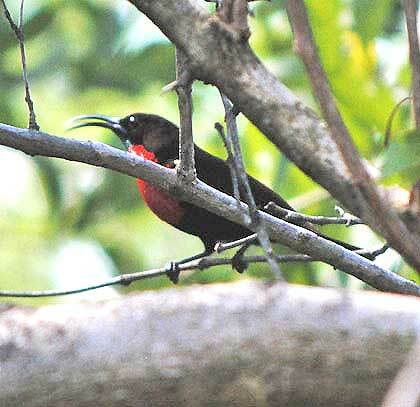 The scarlet chested sunbirds finished raising their fledgling and left the empty nest a few days later.